An epic journey into the natural splendor of Khammouane is a real page-turner. Growing up reading adventure novels by authors such as H. Rider Haggard and Jules Verne, I never dreamt I would find a real place that evoked such feelings of exploration and awe. 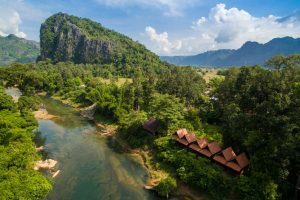 Spring River Resort left me astonished at its amazing service, devotion to sustainability, and the stunning nature it aims to protect. 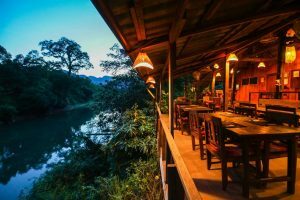 Nestled in a scenic bend of the Nam Hinboun River, Spring River Resort was one of the first hotels in the Konglor area many years ago. 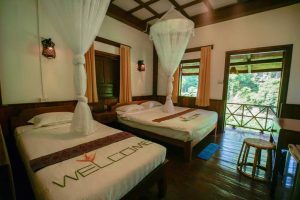 Since 2015, it is under the management of a Swiss-Thai couple, Thomas and Vicky, the newly-renovated resort is heaven for Lao and foreign tourists looking to get away into the uncanny karsts of the Phou Hin Poun National Protected Area. The landscape looked so much like The Lost World that I half-expected to see dinosaurs rumbling through the thick foliage. Boarding a local fishing boat, Thomas took me out to see what really makes this hotel a special find – a secret lagoon! Situated directly across the river from the hotel was the mouth of a small blue stream. When I arrived in the late afternoon, a mysterious fog had developed over this inlet. As we paddled into it, I dipped my hand into the water. “The water is about 4 degrees cooler here, so on humid days this cold water lowers the dew point in the air just above it, creating a layer of fog in mornings and evenings,” Thomas explained. As we paddled onward up the lagoon, Thomas mentioned that the stream is a retreat area for diverse aquaculture, with over 21 different species of fish just in this one area. Mammals, such as bats and small primates, known as langurs, also make their home in the area. Pristine forests flanked both banks. The water was so clear that I could easily see huge fallen trees lying several meters below the surface. They brought to mind sunken treasure ships, lying unconstructed at the bottom of the lagoon. Arriving at the source of the spring, we could see the sapphire water welling up to the surface. Local villagers row boats here to collect fresh water from the source for their daily use. Looking at the imposing boulders near the spring, I noticed something moving – small freshwater shrimp scuttling away from me! The friendly owners are passionate about the area and want to see it develop and prosper in a fair and balanced way. “We bought most of the surrounding land, so that we could turn this area into a nature preserve and protect it from tourism exploitation. 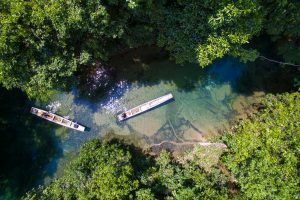 We want to conserve this beautiful lagoon and the forests around it, so that future generations will continue to be able to enjoy it,” Thomas added. 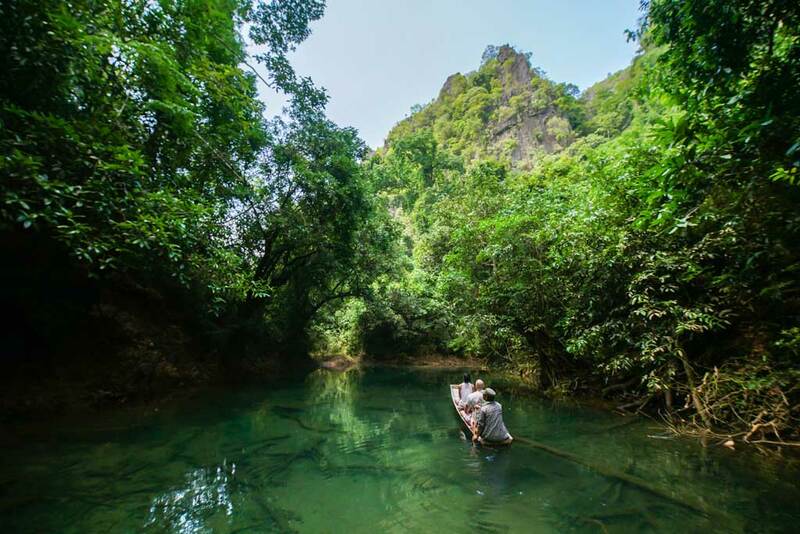 Visitors also like to visit the humongous Konglor Cave, so the resort has created a unique water taxi service which supports local communities by using local boats to take guests 30 minutes up to the cave entrance. Along the way they can see local life and impressive nature hidden from the road. 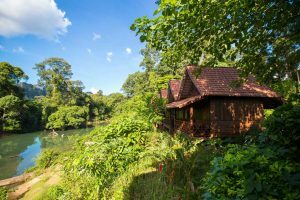 The resort has two levels of comfort: Garden View bungalows, which are cozy bamboo structures with shared facilities; and River View bungalows, which perch above the clear blue river and have en suites. The restaurant serves an unfailingly delicious and unique mix of Thai and Lao dishes based on the local ingredients in season.